For over 27 years, the Bencardino Excavating workforce has been successfully handling the most demanding demolition and land clearing jobs in the Pennsylvania and New Jersey area. From one acre to multiple acres, the team has cleared the way for new neighborhoods, shopping centers, casinos and countless other commercial developments. Bencardino Excavating has a fleet of specialized heavy equipment engineered to complete any scale of demolition with the highest level of safety and efficiency. 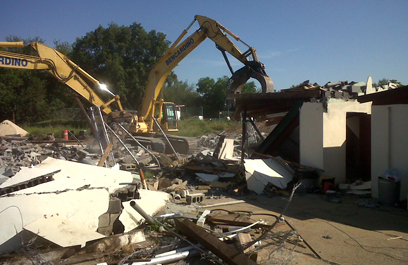 Specialized demolition services include but aren’t limited to: building demolition, saw-cutting, concrete and pavement removal. 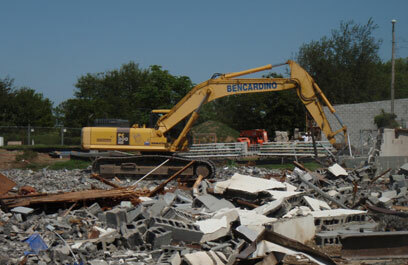 As with every project at Bencardino Excavating, each demolition project is handled with an emphasis on budget, client satisfaction and OSHA safety standards. There are many unknown factors when demolishing a building, so it is important that all planning is performed by experienced demolition contractors. This is what makes Bencardino Excavating the right demolition contractor, for twenty seven years, we have been working with excavating equipment and serving Pennsylvania, and New Jersey businesses. Whether our clients need existing structures demolished or complex site work prep completed, they trust that Bencardino Excavating will complete the work in a timely manner while maintaining the integrity of the construction site to get the project underway and completed as soon as possible. We make sure we leave the site hassle-free and ready for the next step of construction. It&apos;s really a pleasure in today&apos;s world to come up with a company that knows what they&apos;re doing and works as well as Bencardino does with others.